Asbestos is one of those words that struggles under the burden of negative connotations. The mineral that once proved so useful due to its fire-retardant qualities is the root cause of numerous deadly illnesses, including asbestosis, mesothelioma, and lung cancer. For Canadian history buffs, the town of Asbestos, Quebec, is primarily noted for the long and brutal strike in 1949 that many cite as the starting point of the Quiet Revolution. These stories — of the town and of its namesake mineral — come together in Jessica Van Horssen’s A Town Called Asbestos: Environmental Contamination, Health, and Resilience in a Resource Community. While the mineral asbestos was discovered in southeastern Quebec in the late 1800s, the product did not enjoy a mass market until the years after the First World War. The Jeffrey Mine, the geographic and economic heart of Asbestos, was owned by the United States-based Johns-Manville Company. As with other resource communities, the town shared its fate with its largest employer. When business boomed and jobs were plentiful, the population grew, public works projects expanded, and local businesses prospered. By 1960, the mine extracted over twentyfive thousand tonnes of asbestos fibre on a daily basis, making it the world’s single largest source of the product. But not all was rosy within this picture. The aforementioned strike, fought over workers’ pay and safety concerns, lasted 137 days and ended with minimal gains to show for the bitter and occasionally violent event. Likewise, as far back as 1929 the mine’s owners were suppressing information concerning the mineral’s dangerous effect on the health of those who were exposed to it — an odious act Van Horssen likens to the well-documented obfuscation campaign waged by the tobacco industry. By the 1970s it became impossible to deny the deleterious impact asbestos had upon health, and global demand plummeted. In 1983 the Johns-Manville Company relinquished control of the mine. This, however, was not the end of the story of Asbestos as a community, or of the product, but rather the point where the town’s citizens began to display their resilient nature. Utilizing political support and funding from the federal and provincial governments, the mine stayed open, and new markets for asbestos were found in developing nations with weaker public health and safety regulations. This continued until 2012, when support was finally cut and the Jeffrey Mine closed for good. Today, the community struggles to survive. Efforts to diversify the local economy have been more miss than hit, and over the past thirty years the population has halved. Some believe that its very name is a hindrance to future development — but when the mayor tried to change it to something more palatable, such as Trois-Lacs or Phoenix, locals raised their objections. Rather than being ashamed of their past, it seems the townspeople who remain have embraced it with a certain moxie. For those interested in the history of Asbestos, Quebec, this is the book to read. 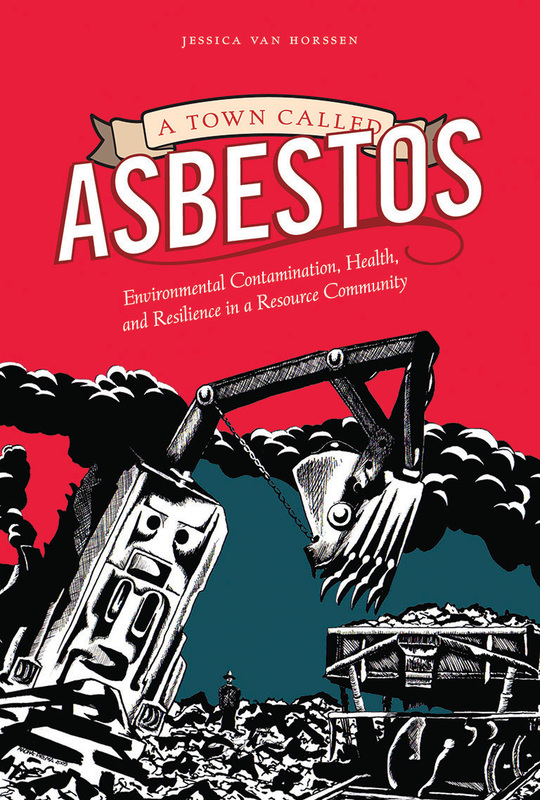 Thoroughly researched in the archives — it is, after all, based on a doctoral dissertation — A Town Called Asbestos situates this particular town within a broader context of resource communities. It also raises some important questions, not only about the survival of communities reliant upon a single major employer but also regarding our federal government’s willingness to use its positive international profile to market a hazardous product to developing nations. Read this book and feel the author’s moral outrage.